Craftastical! 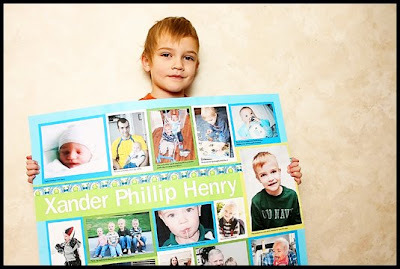 : Xander is a Star! Maybe I'm a little silly, but I'm SO excited that Xander is the star of his Kindergarten class this week. 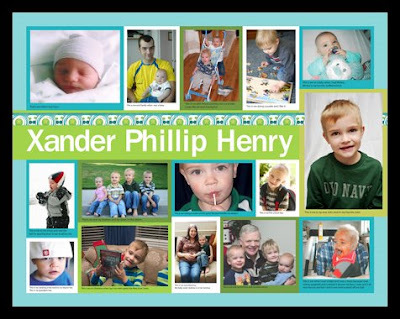 On Friday, we will all be going to share a treat and talk about how wonderful Xander is! I also had to make a poster for him. I actually forgot until Sunday night. I probably would have finished in time if I had remembered that Monday is early day and school started 30 minutes before I was thinking. Luckily, I know myself, so I had an alarm set on my phone. They got there exactly on time. Anyway, I finished his poster last night and Xander is itching to get to school and show it off. Not that I can blame him much. He wrote all the captions for the photos and helped me pick them out. We have a lot of photos. I didn't even get to go through 2005, 2006 or most of 2007. Yikes. This has also motivated me to perhaps better organize my photos and maybe put searchable tags on them. We'll see. Golly Kara, well done you for doing that in super fast time. I'd still be sifting through photographs! Hope he enjoyed his moment and has a great time being 'Star of the Week', it's a really cute idea.